Garden shredders are a fantastic way to reduce your gardening waste down into a more manageable size. They are freely available to hire from garden centres and DIY stores, but if you get through a lot of gardening then purchasing your own could well prove much more cost effective, especially as there are some affordable options out there when compared to hire prices. There are various options available, from small appliances which will shred down twigs and soft greens to heavy-duty models perfect for branches and other hard cuttings. The best for you will depend on what materials you’ll be using it for, but there are other factors to consider as well such as size, fuel and cost. Here is our rundown of the top 10 available. Garden waste, small branches, and leaves can all be shredded down with this effective little appliance from Handy. We can certainly see where they got their name. There is a 3m long power cable. This means it can be situated far enough away from the house not to become a bother for everyone else. Not that it is particularly loud anyway – the crushing is one of the quietest out of those we tested. If you have teenagers who like a lie in on a Sunday morning, it will please them, too. It has a reverse function in case it encounters any jams. There are two large wheels at the rear for easier transportation too. The overall base is sturdy and secure so won’t tip over or be unsteady, and the box is simple enough to remove, empty and replace. As it holds 50L of cuttings at one time, you won’t have to be running to the garden waste bin constantly. The 40mm branch capacity diameter advertised is probably spot on. But as there isn’t really such thing as a perfectly straight branch unless they are cut down. So, we would say that 20mm is more accurate. Watch out for knots and bends as it didn’t cope well with them, but then again no garden waste shredders really does so we can’t complain. Advertised as the first shredder for both soft and hard cuttings, the AXT 25 TC impact shredder is also hailed as one of the quietest on the market. The collection box is included, so there is no faffing around with garden bags and refuse sacks. All output is delivered nice and neatly in this, ready for you to remove when needed. For more compact storage when you’re done, the hopper is fully removable from the framework, so it is only 67 cm high – good for keeping under a workbench or in the shed. In the rare event of a blockage, touch controls help you reverse the shredding mechanism, so it clears without you having to take it all apart and brush/wipe away the culprit. Two wheels on the rear of the appliance will help you transport it around the garden so you can take it to the clippings rather than the other way round, cutting down on the mess left behind. Despite this, it is quite top heavy, so it isn’t the most transportable shredder. But the power it offers kind of makes this understandable. It is a bit more expensive than most others available, but in terms of the value for money, we’d say it is actually pretty good value. If you know you’ll get the use out of it, see it as an investment – it feels sturdy enough to last years. There are plenty of reasons why this is the most popular on the market, and we can safely say that the extra price is worth it. A razor-sharp offering from Bosch, the AXT Rapid 2200 can tackle all of your garden twigs and branches with no trouble (preferably just the harder, drier variety, though). The blades are double-edged and made of hardened steel, and offer laser-cut precision so you won’t be let down by large pieces of shrubbery being left behind. It will handle up to 80 kg of waste per hour, so if you’re having a full day of the family all tackling the gardening, you won’t have to wait around for it all to finish. There is no collection box, but a bucket will easily sit under the chute to collect all of the cuttings for easy removal, whether you want to take them to the compost bin or use as mulching. Or, a dedicated gardening bag will also do the trick. It weighs 11.5kg and is equipped with two rear wheels, so moving it around your garden isn’t a huge task. Mostly designed for woody debris, it will also cut down leaves and shrubs if in amongst the wood/attached to branches although results were varied when we tested. One issue with garden shredders is the frequency in which you need to sharpen the blades, and unfortunately, the ones on this model seem to go blunt with around three hours of constant use. But thankfully, they are replaceable, so if they get beyond sharpening or wear away, it doesn’t mean you have to rush out and buy a whole new shredder. Jams can also be an issue, but they are quick and easy to clear. Just unscrew the black cap behind the feed area, and the whole front compartment comes away, and replace when you’re done to get going again. It isn’t the best at smaller twigs and materials such as grass, but for a shredder which will help you keep on top of any tree cuttings or hedges, you can’t find much better for the price. Plus, we guess it is the most popular garden shredder in the UK for a reason. To weigh things up, it is half the price of some other models but you get much more than just half the performance. Great if you're not wanting to splash the cash. Around the same size and build as the BOSCH AXT 25 TC but around half the price, we had a lot of expectations piled on this cut and crush model. Is it worth paying less? Does it perform just as well? Should we all move away from the more expensive Bosch given that they still have their flaws? Well, we can’t say it is better than the Bosch, but when considering the money you save, we would say it could be worth a go. The large, rubberised wheels make movement a doddle, and we liked the handles on both sides of the appliance which helped with manoeuvring as well as keeping it sturdy while it shredded. Some assembly is required before you get going, such as fitting the wheels, and although this is a bit time consuming and frustrating at times depending on your DIY skills, there are instructions included. However, it is quiet which makes a nice change to some of the others. If you live in a built-up area or get annoyed by constant motor sounds when working, this should please both you and the neighbours. We found it doesn’t deal well with moist leaves and grass at all, and those wiry unpredictable cuttings such as rose bushes and brambles got jammed quite easily whereas some more expensive models tackle them with ease. Clearing jams is simple with the reverse function though. It isn’t the prettiest garden shredder, and at over 30 kilograms it also isn’t the lightest. But the price is reasonable, coming under the mid-price category. There is no tamper, and prodding items through with a stick could be dangerous if not done by someone who knows what they’re doing so bear this in mind. Mid-priced, quiet and good for tackling the woody trimmings. Makita have some great garden equipment available, and this is a worthy addition to out list. 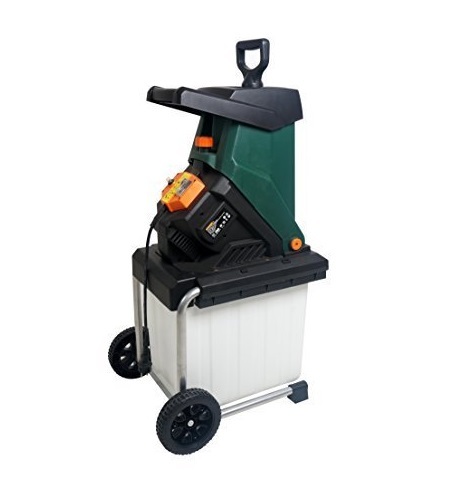 If you’re after a heavy-duty garden waste shredder which is up to dealing with wood, brambles and other forms of hard garden waste, this Spear & Jackson model is both capable and reliable. It is a roller model, crushing the waste as opposed to chopping it down, so the drum and blades should last a lot longer than with other versions if this is a big concern. They are replaceable if and when the time comes, and are a universal fit so widely available – other brands such as Qualcast and Dirty Pro Tools use similar models. There are a few safety features which should protect the user, from overload protection which will cut the power to an automatic feed, so your hands are kept safely away from the crushing mechanism. It can’t be operated if the collection box is not fitted correctly and secure, so the blade is out of reach. A plunger is also included to push any contents down further if needed. We loved the see-through collection box, so you can see how full it is getting without removing it periodically and stopping when you don’t need to. The wheels are quite sturdy and stable, so it is both easy to move and will sit comfortably wherever it is needed. A reverse switch helps you to clear any blockages and jams without removing sections of the appliance and getting your hands dirty. In terms of the build and quality, there is quite a plasticky feel to it. While this makes it lightweight to move when empty, we aren’t sure it would last as long as some of the more expensive options out there. However, it does come in at a great price which is way below the generous performance quality in our opinion, so it could well be worth you taking that risk. Talking of other brands, this model is very similar to the popular Qualcast SDS2810 but retails for less, so if you’ve had your eye on that one, you may be swayed by this. A good budget option without loss of efficiency. Branches, brambles and softer cuttings can be reduced down to a fine mulch with the power of this Ryobi model. Two reversible, hardened steel blades do all of this work, and they seemed to be able to deal with anything we threw at it from the thicker branches to thin, wiry brambles with thorns and leaves intact. A safety plunger helps you to push any stray additions down into the blade area, so your hands remain safe and away from the mechanism. The generously sized collection box also ensures your cuttings are all kept in one place which reduces the amount of work you must do. It is a great price for what you get – not the most capable of all reviewed but actually more capable than some which retail at twice the price. Jams are easy to clear, and although some thinner twigs came through barely cut down, the ability to deal with larger dried wood pieces makes it worth a shot. We quite liked the design too – slimline on the upper and with a not too bulky and cumbersome feel overall. The pop of bright green certainly makes a change too. A lot of pros for the price, and a great shape to navigate around your garden. Complete with a clear collection bin which helps the user to see when it is filling up, this is an easy to use and pretty reliable garden shredder. The price makes it the cheapest on our list, yet it still works just as well as most others. You do have to go slow with it, but this results in pretty good results. The plunger allows you to push through soft greenery, and as long as you don’t do this forcefully, the end mulch seems fine enough for composting. Even though it advertises a capacity of 40mm, we would say that around 25/30mm is its limit without pushing it. Some leaves and twigs do pass through untouched but not enough to become frustrating. It also works best with pretty straight branches, but if you’ve ever seen a tree, you’ll know that these are rare so some pre-chopping may be needed which adds to your time. Overall, don’t buy if you’re set for a large garden clearance and don’t want to be standing around for hours getting it all down to a smaller size. But do give it a go if your garden is manageable and you’ll only be trimming it all back in Spring, and making as much compost as possible is important. One of the most affordable on the market, but yet the performance still makes it a comfortable addition to our rundown. If you can get past the noise and slight slowness then it is a worthy addition to your garden, too. For something minimalistic and does what it says on the tin without any fuss, this Draper model is quiet in operation and features a fully hardened steel roller blade to help tackle foliage. It comes complete with a push stick and a canvas collection bag to help collect all cuttings, which comfortably sits below the chute. Lightweight and fitted with two wheels, transporting it is made easy. Because it is minimalistic, there is no bulkiness, so storage is easy too. Great if you’re low on space. An overload cutout improves safety, and there is restart protection too. The push stick will keep your hands well away from the working mechanisms, and the handle is not only good for moving it around but also for keeping it steady when it is working if it starts to get a bit wobbly. You need to be prepared to pause and clear it all out every few minutes during heavy loading to prevent blockages and jams. Some flexible sticks and twigs easily became trapped, but once they are removed the machine works just fine afterwards again. We’d recommend sticking to a capacity of around 20 mm rather than the advertised 40 mm, to make it easier to deal with everything. Ideal for smaller gardens or light work. To say we think it is a basic offering, the price is a bit steep, but worth keeping an eye on for what is otherwise a decent flexible choice. Great for professional gardeners or landscapers, this heavy-duty model is one of the most powerful available. The 2400 – 3600 rpm blade speed and 15HP 420cc engine make light work of all additions, and the huge 102mm cutting capacity can deal with the largest of branches which need reducing, or a big batch of twigs and leaves all at the same time. You get free Personal Protection Equipment with the purchase, so you’re ready to go the moment it is all built and ready to go. A small amount of assembly is needed, but nothing too major, and all of the pieces and tools are included with instructions. It will hold 6.5L of petrol at any one time and is efficient, so cost-effective to run. As for the retail price, it is the most expensive on our list, but in terms of how well it handles heavy-duty tasks then this price will soon be relative to how much easier it makes your job. For the biggest jobs, there are few out there which could deal with them as quickly, efficiently and with little effort. Complete with everything you need to get you on your shredding journey, this Titan model is a good price for both a petrol shredder and one which feels so robust. You get a little toolkit which will help you out should you have to make any little repairs or check the mechanisms, and you also get a pair of gloves, ear defenders and goggles. A large brush hopper will help you push down any leaves and softer additions, so they are caught by the blades without you putting your hands in danger. The main chute will accept twigs and smaller soft branches and leaves of around 10 mm in diameter, and the large side chute will deal with anything over this and up to 50mm. An overload protection system will cut the power if it is being forced. Results are great, with the mulches and chips perfect for using in the garden for flower beds and paths, or for use in composting. Running the machine seems economical in terms of fuel used, which is good for keeping costs low. It is also pleasantly easy to start up once you get the hang of the mechanisms. The overall build is sturdy so we’d say it will stay with you for a long time. It is one of the more budget-friendly petrol options out there. There are a few negative pointers – it has to be raised above ground level to work best, such as on planks, to prevent jams, and it is difficult to move around. Jams did occur with some of the more bendy twigs. But overall, if your budget doesn’t stretch much beyond this, the little niggles we have are easily rectifiable. One of the more affordable petrol models, which is great if you need the power without the price tag. The fastest to work but also the noisiest. They use sharp chopping blades to cut down waste and deal well with green branches. Results in smaller mulching. More of a crusher than a shredder, they cut the material down then crush it using a roller drum. The results will be larger than with an impact shredder. Suited to anyone with a lot of waste to get rid of. They are more expensive and require more maintenance, but are generally much more powerful. Petrol shredders produce the highest quality chippings and mulch. The cost of garden shredders starts at around £100 for an electric option which can cope with small branches and cuttings, but not well with large bulky items or for heavy duty use. This can soon creep up for more advanced models, and petrol options will easily retail over £600. They are expensive bits of kit, so firstly ensure you will need one. Large gardens or those that quickly get overgrown could be worthwhile, but small basic gardens which require little attention may be best with a leaf blower or vacuum. If you want to make chippings and really cut massive amounts of waste down, investing in a large heavy-duty model could be worth your money in the long run. They may be expensive, but most are a relative price to their power. Torque is a force which causes rotation and is measured in Newton metres (Nm). The higher the torque, the more powerful the appliance. Therefore, if you are after a very powerful garden waste shredder, look for a high Nm. It is only really applicable to shredding devices as opposed to crushing versions. When we say capacity when referring to a garden shredder, we don’t mean the capacity it holds necessarily. It instead means the ‘maximum branch diameter’, and informs you of the diameter of wood it can accept and shred. It is only applicable to freshly cut wood, not leaves etc. While most sit around the 40mm specification, we found that this sometimes pushed it a bit, so we would recommend keeping the wood as small as possible and keeping slow. Forcing the shredder to go beyond the recommendations could mean it breaks or malfunctions, which could be dangerous for the user. Just as with a lawnmower, the capacity of a garden shredder collection box is important. You don’t want to be running to the compost bin every two minutes. Some come with boxes which hold around 50L and are easy to remove and carry. A garden waste bag should sit under the chute of any which don’t include a box. What Are The Best Brands For Garden Shredders? 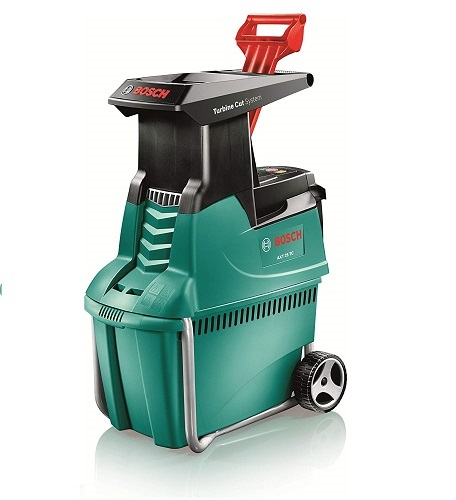 Bosch is the biggest name with most garden equipment and power tools, and the same applies to garden waste shredders. They have a range available, from smaller budget models to larger more reliable options. Other names which are worth looking out for are Titan, Qualcast, Black & Decker, Ryobi, JCB, Viking, Flymo, Makita, Mac Allister and Mountfield. Some retailers also offer their own, such as Challenge from Argos and B&Q own brand. Which Safety Precautions Will I Need To Take? It is widely recommended that you wear Personal Protection Equipment (PPE) – safety goggles, ear defenders, gloves and possibly even a dust mask – when you’re using a garden shredder. This is particularly appropriate when shredding dried wood which could result in flyaways. What Waste Can I Place In A Shredder? Prunings from hedges, foliage from plants, and small branches are what shredders are really designed to cope with. How well your particular model copes with these will depend on the size, length and structure so you may have to test it out. Can I Shred Leaves And Grass In A Garden Shredder? Most electric shredders are designed primarily for wood cuttings so give mixed results with softer greens – we have mentioned the ones which are good and bad in our reviews. Most of the good soft cutting ones are the big heavy petrol machines which will deal with most materials. If you have just freshly cut a hedge or tree and there are leaves in with the twigs, branches and prunings, then you don’t have to separate and remove every single leaf. With the mixture of soft and hard, it should accept them all as long as they’re dried, but some may still come out whole. However, leaves on their own is usually a no. If they’ve fallen on the ground, there could be stones and other unsuitable debris mixed in which will break your shredder. As for grass, the same applies. Even if it passes through, there won’t be much difference in the results. Any ones which do deal with leaves and grass will only be able to shred them if they’re dry. An alternative would be to just add them to the compost bin as they are, as they’re naturally biodegradable. Or, you could get a garden vacuum which does it.